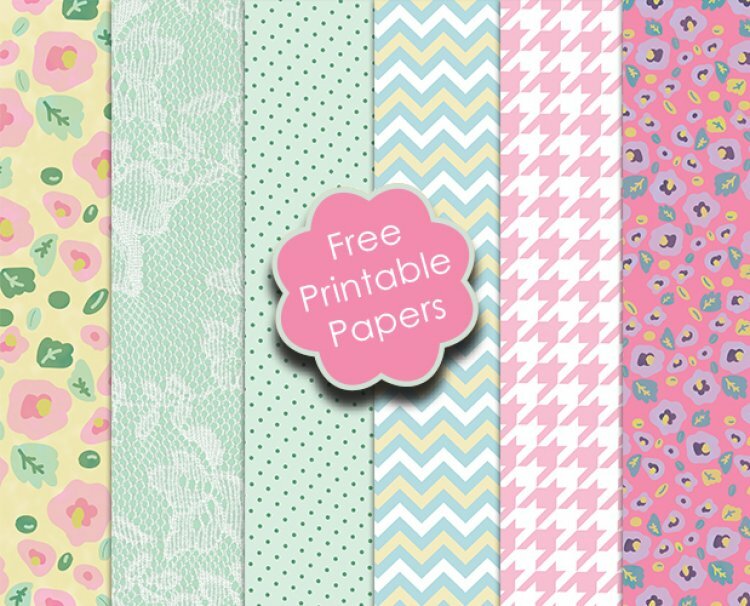 With its pastel colour palette and charming repeat patterns, August’s free printable papers are perfect for summer crafting! 1. Cut the green lace paper into a 14.6cm square and stick to the centre of the card blank. 2. Cut the green polka dot paper to 14.6cm x 8cm and add to the middle of the card. 3. With the green lace paper, cut a 14.6cm x3cm strip and pleat to make a ruffle. Layer on top of the polka dot paper using double sided tape to keep it secure. 4. Use the Fiskars Lotus Flower punch to cut two flowers with the yellow floral paper. Layer together and stick to the left hand side of the pleat strip and add a pink pearl to centre of the flower. 5. To finish, stamp the ‘Happy Birthday’ sentiment onto white cardstock. Once dry, cut the paper into a 7.5cm x 1.2cm strip and cut a fishtail design on one side. Tuck one side under the lotus flower and stick on top of the pleats. 1. With the free polka green paper, cut a 14.5cm square and stick to the centre of the card blank. 2. With the pink floral paper, cut a 13cm square and stick in the middle of the chevron paper. 3. Cut the chevron paper to 8cm x 11.8cm and cut a fish tail design on one side. Stick to the left side of the floral paper, leaving a 1cm allowance between the papers. Cut the green polka dot paper to 4cm x 6.9cm, again cutting a fishtail design on one side. Layer onto the chevron paper, giving a 0.8cm allowance on the left hand side. With a the pink floral paper, cut to 3cm x 4.9cm with a fishtail design and stick on top of the polka paper at 2.4cm. 1. Cut the chevron paper to 11.9cm x 16.9cm and stick to the centre of the card blank. 2. Cut a piece of the green polka dot paper to 5.7cm x 16cm strip and stick to left side of the card blank. 3. To add texture, add a white doily to the centre of the card. 4. Cut the yellow floral paper into a 7.5cm square and stick to the back of the Dovecraft photo frame with double sided tape. Stick the photo frame at an angle to the centre of the card. 5. With the green lace paper, cut a strip to 2.1cm x 5.8cm and cut the pink floral paper to 4cm x 2.5cm. With both papers, cut a fishtail design on one side. Stick the lace paper to the left side of the photo frame and layer the floral paper on top. 6. Stamp the ‘Happy Birthday’ sentiment on a piece of white card. Once dry, cut to a 9.5cm x 1.6cm strip and cut a fishtail design on right side. Using foam squares, stick onto the photo frame. 7. To give the card more depth, we have added a wooden butterfly to the bottom right corner of the photo frame. Don’t forget to share our monthly free printable papers with your friends and family, we would love to see your creations so tag #trimcraft when you post them on social media.